The car of the future may be designed for tomorrow but fondly looks to yesterday for its sense of style. That's the sense you get from this new spot for the Fiat 500, the brand's first TV commercial since it returned to the U.S. in March after an absence of a quarter century. The ad opens with footage of an original Fiat 500 heading to a drive-in movie in 1957, the year the Italian automaker introduced the model. As Elvis Presley's 1957 hit "Jailhouse Rock" plays, the Fiat becomes a 2012 model, as a voiceover says: "Every once in a while, something comes along so powerful in concept, so revolutionary in design, it becomes a cultural icon and defines a generation. Another icon has arrived, and ready to prove once again it's the simple things in life that have the biggest impact." That's a little overwritten, but it's clear what Fiat and Detroit ad agency Impatto are doing—imbuing the Fiat with both an authentic back story and a shiny new polish in a category fairly obsessed with nostalgia. The tagline, "Simply more," positions the model as a deceptively diminutive vehicle that hits well above its weight. The client has spoken of traditional advertising as a necessary evil—the bigger goal is to get people to see and touch the vehicle in person. 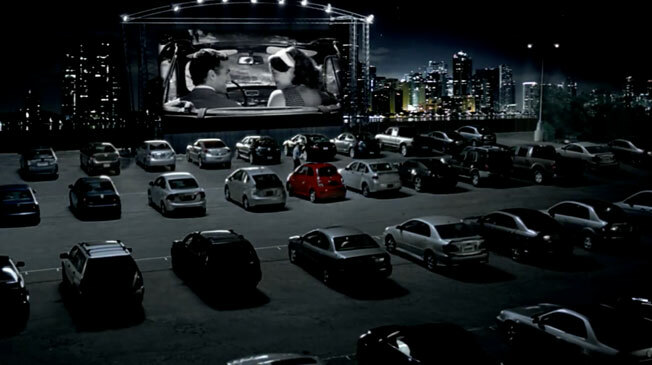 As such, the drive-in theme will extend to events, with Fiat planning to create "pop-up" drive-ins around the country where it will screen original versions of films that have since been remade. (They'll kick things off with a showing of the original Ocean's Eleven on the Jumbotron in Times Square on Aug. 19.) But the brand is balancing the retro vibe with aggressive new-media efforts and ultra-modern messaging, including an iPad app (see below) and a music video (also below, released in May) set in a Fiat factory and featuring a pulsating version of Vivaldi's Concerto in D Major, Rv 228: Allegro as remixed by a Los Angeles-based electronic band. Also notable: Fiat USA has almost 13,000 Twitter followers—many more than Scion or Mini—and 200,000-plus Facebook fans. Print ads will feature headlines such as "Form & Function meet. And begin a torrid affair," "Bigger isn't better. It's just harder to park," and "On a scale from 1 to 10, it's a 500." The car looks great across the various media, and the strategy—both in product development and advertising—seems solid. If you're going to dredge up the past, you'd better be properly engineered for the future.